For the next month, the eyes of the sporting world are going to be on Brazil. And that means the eyes of many sports fans in this country are going to be trained on a TV screen, browser, or mobile device. The World Cup, soccer’s quadrennial showdown, kicks off Thursday when host nation Brazil takes on Croatia in the event’s opening match. The action concludes July 13 in Rio De Janeiro’s Estadio Maracana after 64 matches, each of which will be televised live in the United States. Which is great if you happen to be in front of a television set. But with kickoff times of noon, 3 p.m., and 5 p.m. ET on most workdays, that’s of little comfort to soccer fans who’d like to remain gainfully employed during the World Cup. Fortunately, there’s a Plan B for when the likes of Lionel Messi, Cristiano Ronaldo, and Neymar are in action but you’re nowhere near a TV. All you need is a browser or a mobile device (and, as we’ll get to in a moment, a cable TV subscription). For World Cup coverage in the U.S., the four letters you need to know are ESPN. And that’s not necessarily a bad thing. The cable sports network is throwing its entire weight behind World Cup coverage, with every match available in high-definition on either ESPN, ESPN2, or ABC. And ESPN is supporting online viewers just as completely: All 64 World Cup matches—from the group stage to the final—will be available at WatchESPN.com. ESPN is also going to stream matches to connected devices, including Apple TV, Roku, and Amazon Fire TV, and both Xbox 360 and Xbox One through its WatchESPN app. Just this month, WatchESPN added Chromecast support, so you can now beam World Cup matches to Google’s $35 streaming stick from your phone or tablet. Catch every World Cup match live on the WatchESPN app, available on a multitude of platforms (provided you’ve got a satellite or cable TV subscription). Speaking of mobile devices, WatchESPN also comes in iOS, Windows 8, and Android versions (including an Android release specifically for the Kindle Fire), allowing you to watch the World Cup even when you’re on the go (though it’s worth noting that streaming live video over a cellular connection is a real good way to burst through the ceiling of your wireless data plan). A nice thing about WatchESPN: You’ll have access to multiple languages and alternate feeds—recent streams of US friendlies against Nigeria and Azerbaijan included tactical and fan cam views of the match. WatchESPN also features streams of other sports, making it a valuable addition to your mobile device long after the winning captain raises the FIFA World Cup Trophy. 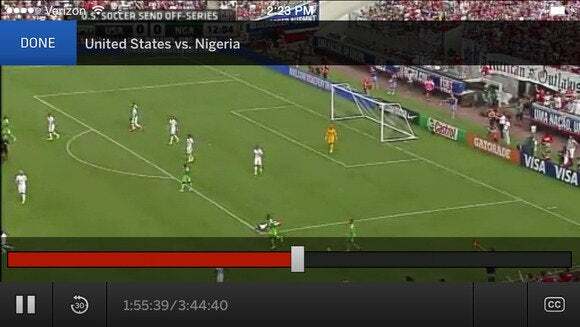 The Tactical Cam view for WatchESPN gives you another view of the match. 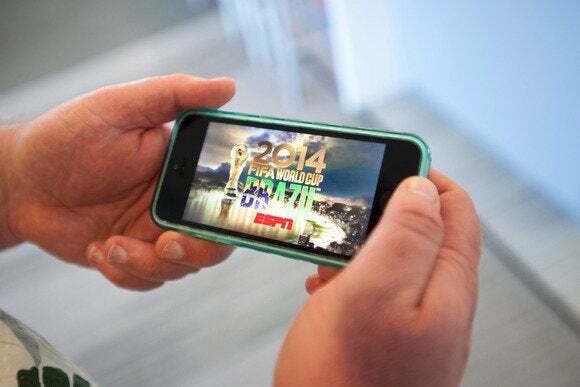 “By creating the most comprehensive experience that is live, personal and social, we will be at the top of our game in serving sports fans with anytime, anywhere, any device access to every match, goal, star player, news story and commentary,” said John Kosner, executive vice president, ESPN Digital and Print Media, when outlining ESPN’s digital plans for the World Cup back in May. As extensive as ESPN’s coverage is, for an event with the World Cup’s global reach, it can be enlightening to watch the coverage from other parts of the world—particularly if you’re living abroad and miss hearing the coverage in your native language. Watch Maradona’s “Goal of the Century” from the 1986 World Cup and try to tell me that it isn’t enhanced by Victor Hugo Morales’s play-by-play. There’s a pretty simple solution—mask your IP address so that you can access websites in other countries. A U.S. district court ruled last year that masking your IP address so you can go to a blocked website violates the Computer Fraud and Abuse Act, but some contend the ruling has a fairly narrow scope—certainly not the sort of thing that’s likely to land you in hot water if you just want the BBC’s feed of the England-Italy match. Still, logging in via a virtual private network to keep your whereabouts a secret is an ethically gray area, even if there are plenty of services—both for Windows and the Mac that will be happy to help you surf the globe for a small fee and very few questions asked. Throw in a list of FIFA’s media rights holders, and it shouldn’t take too much detective work to figure out how to enjoy another country’s World Cup broadcast.